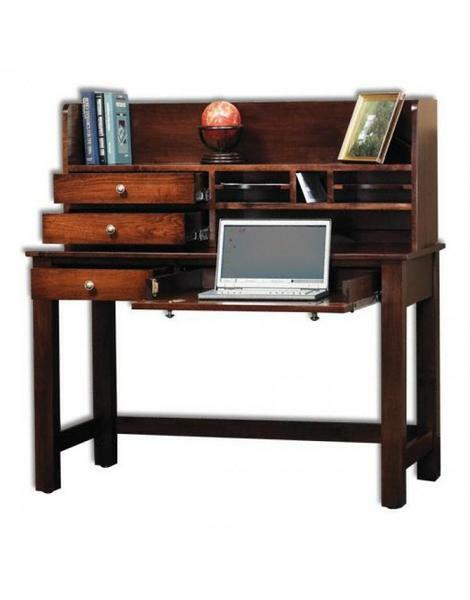 Organize your work station in style with this beautifully crafted Rivertowne Petite Writing Desk with Hutch Top. The hutch top organizer offers plenty of small drawers, paper slots, & cubby's for your writing essentials like paper, envelopes, pens, stamps, & documents. The convenient pull-out laptop/keyboard tray is also a convenient feature that helps you save space by providing a place to keep your laptop & keyboard other than on the desk top. Get your order started today for this stunning and unique Rivertowne Petite Writing Desk and enjoy the quality of Amish handcrafted furniture first hand.